MailBot account creator updated to version 10.23. Good news: on April 6, 2019, Rambler turned off the mandatory phone verification and returned the signup form with reCAPTCHA and an answer to the secret question. MailBot account creator updated to version 10.6. Outlook account unlocker using phone verification was implemented according to numerous requests. To use it, you must check the box “Unlock accounts” on the “Checker” tab. Any phone number can be used to unlock an Outlook account requesting an phone verification upon login. This functionality is implemented for diagnostics, when it is necessary to find out numbers of which operators are better suited for accounts creation on a particular email provider. MailBot account creator updated to version 9.93. Aliases creation support was implemented for Mail.com and GMX.com accounts. Alias for email is a virtual mailbox, all messages to which come to the main (primary) mailbox. Aliases are used to hide your primary email address when you create account on doubtful sites. MailBot 9.85. GMX.de account creator and checker! MailBot account creator updated to version 9.85. Account creator and checker of German email provider GMX.de was implemented! Important! GMX.de allows signups only from IP addresses of German-speaking countries: Germany, Austria, Switzerland. For all other countries, the error “ERegLimitReached: Exceeded the limit of accounts from IP address” will be generated. As always, the update is completely free for users of the full version of MailBot. The rest customers, as always, can buy GMX.de account creator and checker with 50% discount (you can calculate your price including discount here). MailBot account creator updated to version 9.72. 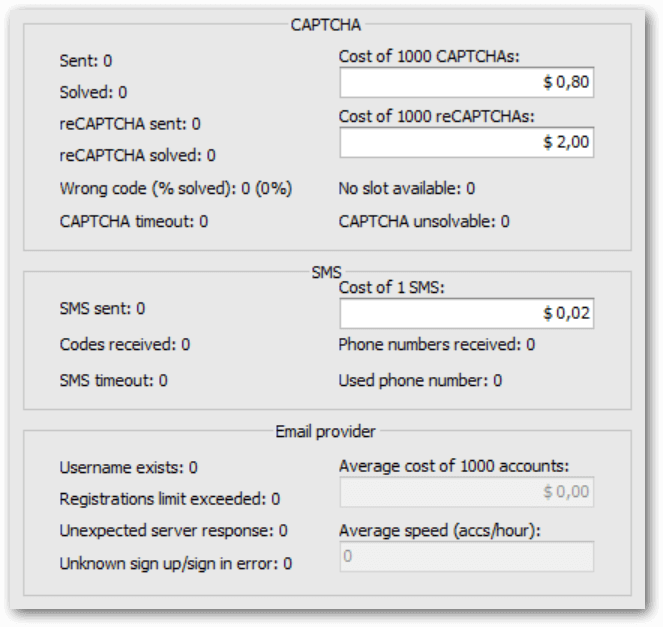 Also now you can separately specify the price for 1000 reCAPTCHAs v2, which allows you to correctly calculate the costs even for providers which require to solve different types of CAPTCHA to create one account, for example, GMX.com. Advertising in MailBot	This site runs on the Inferno&apos;s server.